We want to give you some comics! The only thing you need to do in order to enter a raffle to win this one is comment on any of our articles. Starting since Trey's original post yesterday, and for a week (so until next Monday at the time this article gets published), all commentsautomatically get a ticket for the raffle, so comment often, comment well and we will find out in a week who gets this. Other contests to be announced this week, so check back, you won't be sorry!!! The preview for this show looks great. No idea it had a super-natural bent to it. Perhaps I should read the books eh? As soon as I saw the preview I went back and removed the dust and started reading my pile. I guess I need to start looking for this lol. Read the first issue – I didn’t much care for it and with a print run of ~90K it’s unlikely to “blow up” like The Walking Dead. Neither of these, however, stopped me picking up copies at cover price upon release. It’s an easy £15-20 seller on eBay. This photo variant fetches twice that in the UK. Presumably us international folk are eligible for the competition? Yes, everyone can participate, if the winner lives outside the USA they would just have to pay the shipping, I believe. Super kind of you guys for the contest! Everyone is all hype about the preview to this show, but only time will tell if it’s good. As in my opinion it seems that anything Kirkman writes currently, tv execs want to option it as a hit. Now don’t get me wrong, the book is very good, I currently enjoy it but no telling if it will be as go when it comes to the big screen. This is Kirkman at his finest. Very generous! Thank you for the contest, as well as the site! Can’t wait for Outcast!!! Great gesture guys. I thought the show looks itresting …only thing that wonder is the actor who plays Barnes the kid from Vampire Assitant who was like a frog boy ? almost bought this box set today…. That’s pretty awesome of you guys! Love all these free giveaways. The guys this run this are fantastic! Thanks guys. Enjoy this site a lot! It’s actually a real good read…. I rarely comment, but I do on CBSI. This will definitely get me in the conversation. 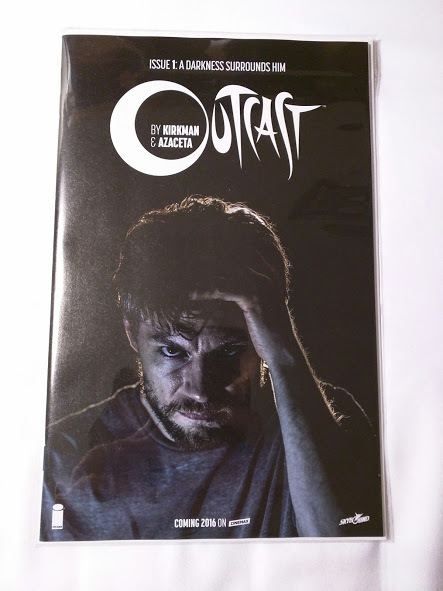 Plus the issue will pair nicely with my Outcast #1. Thanks for the chance! Blown away by this, will have to pray to Thanos, Galactus or Willy Lumpkin that i have a chance !!! Outcast sounds good. But I already have tons of tv on the list to watch! Sounds great and nice incentive. Thanks for the awesome site and all the great articles. Can’t wait for the first winner. I’m glad I was able to snag a #1 copy ahead of the tv deal. Now I hope the show is as good as the comic. Thanks for the contest you guys ROCK!!! If you are a Skybound Insider you could have bought these on their website on Tuesday for $10. I picked up 4 myself. It is an awesome book, I love reading it. Hope it is a hit as a T.V. show.